We believe that children learn through their experience with the outside world as they play. 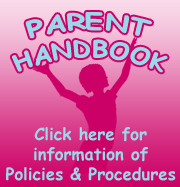 We want to expose them to a variety of positive, age-developmentally appropriate activities and materials. During play we want to foster their curiosity and growth. We hope to make learning fun and we believe that children learn best when allowed to explore and discover at their own rate of development. All of our classrooms contain the following learning / activity centers. Math, science and technology: everyday math counting, math vocabulary and numbers, biology and earth science, computers and problem solving skills. Social Development: caring, sharing, honesty, taking turns, respect, responsibility and self respect. Conflict resolution: strategies to deal with conflict, positive interactions and socialization. Health, wellness and fitness: active games, developmentally appropriate sport games, and nutrition. In addition, activities involving sand and water play, and cooking are on our schedule. Activities are designed to be interesting and developmentally appropriate for the children, such as Pre-school learning, reading, puppets, music, instruction and reminders about the schedule and or rules and guidelines in the classroom. Children will have options from several activities in the classroom that give the child leading in unstructured learning. Small group activities can be initiated by the teacher and or initiated by the children themselves. Games, toys, individual play and group play will be encouraged. 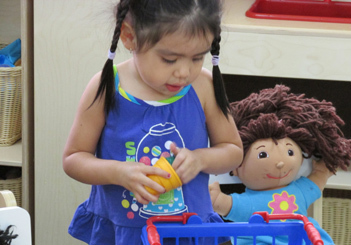 Here at Dina’s Day Care we are committed to improving the nutrition and physical activity of all children. 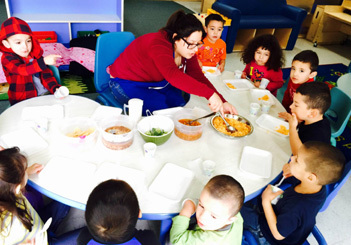 Our program and our staff are committed to promoting a pleasant environment where developmentally appropriate foods are served; where there is an emphasis on family meal style service; and where Staff and Parents choose when and what to eat, and the child “self-regulates” intake. 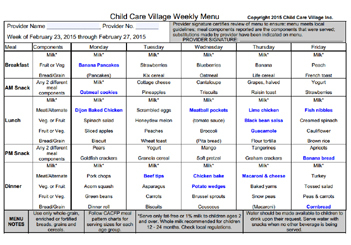 Healthy, nutritious meals will be served daily and one or two healthy snacks will be offered each day. Lean meats, fruits and vegetables which promote optimal health will be included in our menus, servings on entrees and side dishes will be regulated by the child, and we will use low fat dairy products and 100% fruit juice only once a day. Offer water freely. We will take great care to avoid high sugar sodas and juices and high salty snacks, and serve healthy foods when celebrating special events and recognizing birthdays.